Army, navy and air force commanders have been replaced with new generals in a high-level meeting of Turkey's military and civilian leadership, President Spokesperson İbrahim Kalın announced at a press conference Wednesday. Incumbent Gendarmerie Commander. Gen. Yaşar Güler has been appointed as the new army commander, reports said, whereas Vice Adm. Adnan Özbal has been appointed the new navy commander and Gen. Hasan Küçükakyüz the new air force commander. 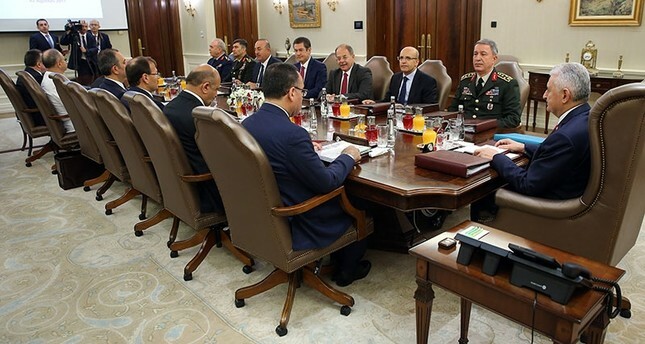 The Supreme Military Council (YAŞ) meeting at the Çankaya Prime Ministry Office with Prime Minister Binali Yıldırım chairing the event lasted over four hours. The term of office of eight generals have been extended for one year, whereas 61 colonels have been promoted as brigadier generals and rear admirals. The term of office of 168 colonels have also been extended for two years. The decisions made at YAŞ gathering were announced by Kalın after being ratified by President Recep Tayyip Erdoğan. YAŞ members first visited the mausoleum of Turkey's first president, Mustafa Kemal Atatürk, before going to Çankaya where the meeting is being held. In the opening speech, Prime Minister Binali Yıldırım highlighted that Turkey continues to fight terrorist groups with determination. "Ongoing instability along the countries on our southern border, as well as the lack of proper governance and civil war pose the biggest threat to our fight against terrorism" Yıldırım said, adding that it is also crucial to carry out economic social rehabilitation projects during security operations. He also noted that the constitutional changes, approved in a recent referendum will allow the Turkish state to overcome critical domestic and international developments amid ongoing conflict in the region. President Recep Tayyip Erdoğan is expected to host a dinner for YAŞ members at the Beştepe Presidential Complex Wednesday evening. YAŞ meeting is a bi-annual gathering which discusses the appointments and retirements of high-ranking staff officers and generals, as well as the removal of military personnel. In the aftermath of last year's failed coup attempt by the Gülenist Terror Group (FETÖ), the government restructured YAŞ, handing more seats to Cabinet ministers and reducing the military's representation. In line with the change, the deputy prime ministers, the justice minister, the foreign minister, the interior minister, the defense minister and the prime minister will attend the meeting along with the commanders of the armed forces. Previously, the president, the prime minister and the defense minister were the only civilian representatives in the council. The military was brought under further government control after the July 15 coup attempt, and the commanders of the Army, Navy and Air Forces were ordered to answer directly to the Defense Ministry. In addition, the president and prime minister were given the authorities to issue direct orders to military commanders without the need of any prior approval. According to military sources, the fight against FETÖ, the status of the chief of general staff and other commanders would likely top the council's agenda Wednesday.